My little moped is awesome. She will do great for work and back. Only 3 pounds to fill up as well. Got it off of my boyfriend's work colleague for cheap value to say it was 2009 reg. Passed my CBT and got everything sorted with it now! Got my bunny ears on my helmet as well. I'm all "pinked" up! My little tinker! 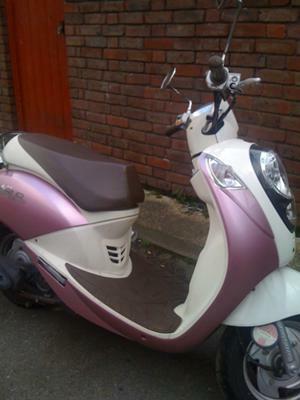 Comments for 2009 Sym Mio 50cc- Pink! Hi! I liked your bike. I started out on a 250 scooter myself and then I got a 400. I ride motorcycles now too and since I have a lot of experience with scooters, I think I can safely say that there is a lot of skill involved in being a good moped or scooter rider too. I respect all two-wheelers out there on the road...heck, three-wheelers too. And if somebody wants to dis me because they have a bike that they've attached some meaning to because it was made in America or cost more than mine....well, it just shows me that they needed some kind of symbol for themselves. I don't. We're all riders and it can be just as dangerous to wreck a scooter or moped at 40 mph as it is to wreck a motorcycle at 40 mph. motorcycle. Anyway, I like your bike. I hope you have a lot of fun on it and get where you're going safely. She is mega cute and I know you will have lots of fun together! As for the "haters" dissing the scooter for not being a bike, how many car drivers diss us bikies? And Harley owners diss other bike riders? Time to get supportive and embrace all two-wheeled buddies. Obviously it isn't a motorcycle, I never said it was.. I said it was a moped. And thanks! I do love my little moped!! She's nice to ride to get here and there to places. Sorry. That is not a motorcycle. Plain and simple. I love it! It's sooooo cool, and pink. I have a 250 Hensim Cruiser 2007, which I love very much. It gets 70 mpg, but with gas prices rising, I decided I needed another bike too, just in case, right. So I bought myself a 500 watt electric scooter, mine is silver and it gets 25 to 30 miles to the charge, it also is great for around town. Also if the charge runs out, mine also has peddles I can install quickly and still get home. I'm glad to see others are starting to see the light. Small things come in big packages. Enjoy your ride. We will be riding when everybody else has stopped. yea!